Mia Wasikowska, Johnny Depp, and Helena Bonham Carter star in a film written by Linda Woolverton, based on the novels by Lewis Carroll, and directed by Tim Burton. 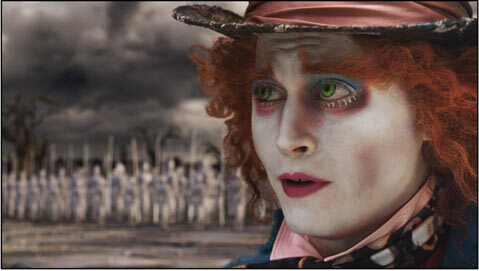 Johnny Depp stars as The Mad Hatter in <em>Alice in Wonderland</em>. Alice in Wonderland, Lewis Carroll’s great hallucinatory tale down the rabbit’s hole, has been perennial fodder for remakes and new interpretations in the film medium, from Disney’s animated classic (with its haunting sweet theme song) to existential Czech animator Jan Švankmajer’s creepy and splendid Alice. Now—perhaps inevitably—comes the Tim Burton/Johnny Depp model, big of budget, low of spirit and respect for the original. Capturing Carroll’s surreal whimsy on film is a much harder and more delicate task than it seems, and Burton isn’t much up to the challenge, apart from throwing CGI, 3-D, and nutty antics at the story, which has been rather brazenly “updated” in Linda Woolverton’s script. (This Alice is 19, dodging an unwanted engagement bullet, and taking a second trip at the behest of the “rabbit in a waistcoat”). As expected, the high tech, fantasy-loving Burton has some great fun along the way, mining the story’s fields of dreams and crazy shifts of scale and sanity along Alice’s woozy path. Still, self-justifying dream logic should be the goal in Wonderland, in keeping with Alice’s continuing mantra, “This is my dream. I’ll decide where it goes from here.” But no. From another sensory angle, Danny Elfman’s intrusive musical score seems all wrong; it’s big, pompous, and cliché-riddled, where a lighter and, well, “curiouser” touch seems needed. Still, there is fun to be had along the way. As the bulbous-cranium-ed Red Queen, Helena Bonham Carter is a villainous hoot, who bites off the words “off with their heads” in the most delightful way. As Alice, Mia Wasikowska does a fine turn as the alternately rational and accepting rabbit hole tripper, and the wooly and wide-eyed—not to mention half-mad—Johnny Depp fills his contract as a handsome Mad Hatter. In the end, though, Alice according to Burton feels like a commodity-style blockbuster: it’s no great shock to learn that it broke first-weekend box office records for this time of year. This Alice has the feel of a Hollywood sensation, coming soon to a lunchbox and fast food chain tie-in near you.